Artist and photographer Jennifer Parkhurst met her first dingo over 25 years ago on the beach in Womboyne National Park, New South Wales. It was love at first sight. Since then she has travelled to almost every state in Australia – through the outback, along little-used desert tracks, to places remote and strange, and, inevitably, to World Heritage Fraser Island to fulfill her passion for photographing and studying Australia’s native dog. She spent up to six days a week over five years working in the field on the island in order to reveal the intimate details of the dingo’s life in the wild. Learn about every aspect of the dingo’s life; where it lives, how it raises its pups, how it hunts and what it eats; its family social structure;its character, and much more. 180 beautiful photographs, all taken in the wild. Jen, Lois would be so proud of you. I really enjoyed the book, and look forward to a second reading. How wonderful it would be if such a series about ALL our Aboriginal peoples existed! I adore the painting featured on the inside cover of Smiley Dancing with Dingoes. I love that you used language. That the essential myths are presented with the word-picture of the past. When I first read Wild Dog Dreaming, one of the (many) things that struck me was the parallel she drew between the ‘treatment’ of the Aboriginal people and the ‘treatment’ of the dingo. Your book expanded on that (to me) truth, and is a significant point in case. Land rights! Without the ‘right’ to exercise one’s traditional relationship with the dingo! To manage one’s ‘land’! It is enough to make one cry. And you expressed it all well enough to make me do so. Where can I buy this book in Melbourne. My sister in Scotland really wants one. Hi, do you send your book to Europe/Austria? 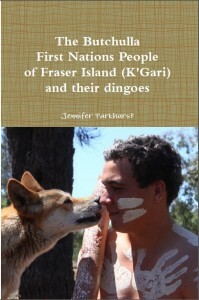 I have bought your book today on Fraser Island, after having spotted two Dingo’s with my friends on a tour. The book caught my attention the moment I walked into the small store on the beach. I cannot wait to start reading it! The photo’s are absolutely wonderful! They remind me of the love I received from My beautiful Border Collie Zapp. Where can I purchase a copy of this wonderful book please? its a wonderfull book. Jennifer, you really are an inspirational person and photographer. it is indeed a beautiful book. beautiful photos by a beautiiful person. Such a great book Jen. The photography, info & your understanding of the beautiful dingoes are inspirational. Enjoyed reading it on the plane to Thailand. K.A. Thanks for sending my copy of Vanishing Icon,what a wonderful book..I only hope it may become available in all bookstores and libraries in the near future and raise awareness of the dingoes further. We attended and it was fabulous.A big thank you to Jen Parkhurst for an enlightening presentation.Question time was interesting with local paddler saying baits laid on nth shore(noosa) are killing eagles and brahminy kites. and I really enjoyed your forum at Noosa yesterday. thank you for a wonderful and interesting morning I think you should be given a PHD for all your re-search and work with the dingoes. spending some time in Colorado at a wolf sanctuary and gave them Jennifer Parkhurst’s book about Fraser Island Dingoes, Vanishing Icon. Great photos, great information and they liked seeing the comparison between the dingo and wolf. will be spending more time with them there this week. were do you buy it????????????? Your book, “Vanishing Icons” arrived here in Canada as a Christmas gift from my mate and yours, Cheryl. An extra special touch was that you signed it for me. I have to say, it is one of my favourite books. I have read it from cover to cover a few times now and each time, you have managed to teach me something new about Dingos. Even my husband, Jorge, has read and enjoyed your book. I feel that this is a book that should be used in the schools to teach our children about one of Australia’s Icons. This being said, if the government of Queensland continues their inhumane treatment of the Dingo and through their miss management of this pure breed of animal, allows them to disappear into extintion, our children will only know of them from reading your book. This is a very sad state really. As someone who would love to visit Australia one day, I definately want to be able to see these beautiful animals in the wild living the way that our Creator meant them to live. I find the treatment of you by the government of Queensland totally irreprehensible. If I were in your shoes and had seen starving Dingos trust me, I would have fed them as well. People committing more serious crimes get less of a punishment. Feeding starving animals should not be a punishable act, if anything, you should have been thanked for trying to do right by them. How does one just stand by and watch an animal starve to death? How does one mutilate an animals ears preventing them from doing what comes natural….listening and hunting for their food. I have family and friends living in Australia and they are totally disgusted in the treatment of one of their fellow citizens for standing up for the right to life for an animal that will soon only be a memory if the government continues on this path. I love your book, Jennifer. A true work of art. The photographs draw one right into the world of the Dingo. Your explanations as to the way that they live, only one word comes to mind, Educational! Yes, your book should be part of the school curriculum. Keep your chin up my friend. Just remember, you are much loved and respected over here. You stand up for what you believe, We Animal warriors will stick together. Thank you for writing, Vanishing Icon, a truly wonderful book. I wish you much continued success with your book, many more runs, and the hope that one day soon, the government of Queensland will see the error of their ways. Jennifer you are amazing & very inspiring…being a photographer & an animal lover myself i found it hard to watch Australian Story without getting upset & angry.I’ll be buying the book, signing petitions, emailing the Bligh Government & spreading the word. And live in HOPE that things will change soon. Received Jennifer’s book in the mail today. It’s Dingo beauty in book form. I will definitely be buying a copy for one of my best friends in America closer to her birthday. I think she’ll love it! Received my “VANISHING ICONS” book by Jennifer yesterday. What spectacular photos, showing so many different aspects and moments in the lives of dingoes. A great book which will make fantastic gifts for friends, and to which the reader will return time and again. Thanks, jennifer! “if you kept an animal in this state at your home you would be prosecuted”. I bet the Aboriginal people who lived on the island would never have let this happen. I watched Australian Story last week. I believe you (Jennifer) have been unfairly treated, & have been made a scape goat. I cried watching the puppies die & seeing the poor condition of the adult dogs. I’ve got tears now typing this message. 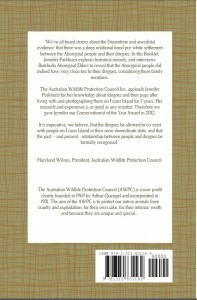 The dingoes need help, and it’s thanks to people like yourself, that their plight has been brought out of the dark. Thank you. How beautiful are they. So innocent. How dare they put that tag on their ears. It is like the collars they put on kangaroos. We should make those that do this to them suffer the same fate. Tag their ears. May the print runs be many and the effects beneficial! Would love to see this magnificant book in all the schools and libraries around Australia, it certainly deserves to be. Fraser Island is World Heritage listed, a heritage for all to enjoy, yet QPWS won’t rest until all the dingoes are out of sight, why? Can you imagine going to Yellowstone Park and told sorry you can’t ever see a wild bear, or wolf, or told you can’t see lions, tigers, etc when visiting National Parks in Africa? Those countries have learnt to manage both people and animals, when will the dingoes on Fraser be given a fair go, when will there be a balance? Congratulations Jennifer on a wonderful book! You went Global at 11.24pm. I hope the Book sells out very quickly and you get a few more print runs.